This is a reissue of a historically significant recording, although you wouldn't know it from the cheesy cover art, nor indeed from the meagre liner notes. 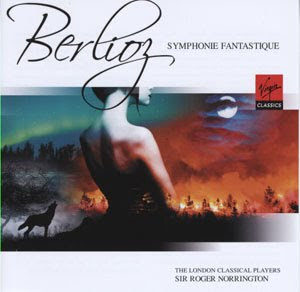 It was one of the first period instrument recordings of the Symphonie Fantastique, dating from the late 1980s when the period performance movement was first turning its attentions to the Romantic repertoire. It also pre-dates the more famous Gardiner, so it is interesting to hear how Norrington reconciles the technical challenges of his ophicleides, tinny percussion and such like with entrenched audience expectations. Of course, the unusual brass and percussion sounds only really come to the fore in the last two movements. In the first three, the most significant period colour is the sound of the gut strings playing without vibrato. To my ear, these earlier movements are the most successful. The precision of the string playing is excellent, and the atmosphere they achieve in both the first movement and the Bal is at least the equal of any modern instrument version. The audio quality is also impressive, at the top end of what was possible in the late 1980s. In fact, listening to this, it is easy to get nostalgic about the days when studio orchestral recording was the rule rather than the exception. In the third movement, the focus moves from the strings to the winds, and both soloists play with elegance and passion. The playing here is surprisingly modern, and there is no apparent attempt by the woodwind soloists to emphasise the antiquity of their instrumentation. Then the timpani make their piano entrance, and we get the first taste of the more exotic colours to come. I'm guessing (in the absence of any information from the liner) that the drums are small, shallow and have hide skins. The focus of their sound is a real benefit to the dramaturgy, whether representing thunder or the executioner's drum. In the last two movements, it is the brass that makes the real difference. The Dies Irae played on ophicleides is a completely different effect, loud but not forceful, and with a couple of really dodgy notes where the key technology fails to maintain the intonation. The trombone pedals in the March to the Scaffold are great, but suggest wider-bore instruments than Berlioz would have known. I'm not very impressed with the bell sound, whoever authentic they might be, they come across as tinny and congested. But leaving aside issues of instrumentation, the main problem with this recording is a distinct lack to drama or excitement in the last two movements. The pace of both is on the steady side, and although Berlioz writes few tempo markings, there is surely scope for more rubato than we are presented with here. That lack of punch is a real shame, because the orchestra are on top form, and demonstrate a real mastery of their exotic instruments. It is a good recording, but it could be so much more. Les Francs-judges is given a serviceable outing and brings the running time up to an acceptable 65 minutes. The nasal but peircing piccolo is the period instrument sound to keep an ear open for here. They could have squeezed another concert overture in if they'd tried, but lets not quibble too much about that. A historical curiosity is probably the best way to summarise this recording. It's good, but it doesn't quite deliver on its considerable potential. And whatever you think of the recording, the ethos of the reissue is bound to leave a sour taste. The cover gives the impression that it is being marketed at buyers who neither know nor care about period instrumentation. But for those who do, the timing will seem suspicious. To put this out just a few months after the acclaimed, and in fairness much more imaginative, period instrument recording from Jos van Immerseel (Zig Zag Territoires ZZT 100101) seems like very cynical marketing indeed.